The Terms and Conditions detailed herein are general in nature and refer to all works, regardless of type carried out, or to be carried out, by Asbestos Training Limited. Work quoted for will be carried out following the receipt of a client order. Verbal orders will only be acted upon following the return of an Asbestos Training Limited official booking form or online booking form. Any provisional dates offered are provisional until a booking form has been received. Any delegate that has learning difficulties or will require assistance with their training is advised to contact us to discuss their requirements prior to booking. The client agrees to provide an adequate training room for the number of delegates to be trained as per the confirmation of training issued. Where the course requires an examination, the client must ensure the room is suitably sized to accommodate an exam room layout, failure to ensure this may result in non-examination at the client’s expense. Asbestos Training Limited will provide all audio and visual equipment; the client must provide a screen or wall to project on to, along with suitable power points for the tutors use, unless otherwise agreed. Where the booked course requires practical assessment such as New Operative, the client must supply all tools and equipment including enclosure, airlocks, decontamination unit, overalls, RPE etc. to ensure the practical assessment can be carried out in accordance with the current guidance requirements. 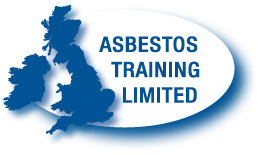 Course fees include tuition by an Asbestos Training Limited tutor, course notes, and all expenses incurred by Asbestos Training Limited employees i.e. overnight and travel expenses, subsistence. All prices quoted by Asbestos Training Limited with a view to undertaking a work, are exclusive of VAT. All works will be invoiced on receipt of booking form or at least 7 days before works are carried out, & subject to the same terms as section 9 of this document. the client cancels the agreed booking, Asbestos Training Limited reserve the right to charge a levy of 80% of the proposed works if cancelled more than 14 days prior to the work, less than 14 days will result in the full agreed sum being charged. Asbestos Training Limited reserve the right to charge interest on the full invoice value of any overdue or non-payment invoice during dispute at a weekly rate of 10% above current base rate. Asbestos Training Limited reserves the right to adjust prices quoted in its literature if necessary, after a 30 day period from publication of such literature, this will not affect fees already paid. The training course must be held within a 20 mile radius of SG8 7TQ. For work outside of the above area, additional expenses will be charged viz mileage, overnight accommodation, subsistence. A maximum number of 12 delegates is included, any additional delegates will be charged accordingly. The rates must be pre-paid and are for training services only and do not include any consultancy services. Any delegate not showing for their booked course will be charged for their training and if paid online, no refunds will be given. The rates quoted are subject to change, for more information please contact us. There is no pre-requisite for undertaking the "E" Learning Package and is open to any delegate who may require specific certification for asbestos awareness training. It is the responsiblity of the purchaser to determine if online asbestos training is suitable for their requirements. The UKATA Asbestos Awareness E Learning certificate obtained will be valid for one year, and the certificate issued will hold an expiry date. Once expired delegates will have the option to revisit the "E" Learning Package and re-complete the latest course and test. Once the user has logged in, this constitutes acceptance and no refund will be issued, nor will refunds be issued where the delegate has obtained their certificate. Payments are subject to items 7 to 9 above. Once payment is received your login details will be emailed directly to you on the proviso the payment being cleared. This is subject to normal office working hours 8.00am - 8.00pm. All training material provided to the applicant will be in accordance with and comply with the Control of Asbestos Regulations 2012. All material for the asbestos awareness course will be correct at the time of publishing and will be updated accordingly as and when the legislation and guidance change. The submitted information on completion of the course will be held by the Asbestos Training Limited for a period of one year in accordance with the Data Protection Act, no personal information will be passed to any other party. All certificates will be issued to the successful applicant direct via email, unless otherwise agreed with the person paying for the course. Each certificate will be marked with a unique reference number for verification purposes. Copy certificates are available, however we reserve the right to charge an administration fee for these. We do not issue expiry times for purchased logins, it is advisable to use these at your earliest convenience, Asbestos Training Limited can only provide access to UKATA approved e learning while it is still available and offered through UKATA, if UKATA decide that no more e learning certificates will be issued, we cannot be held liable and cannot issue a refund for purchsed credits, likewise should we no longer become a member of UKATA again no refund would be issued for purchased credits. Refunds will only be issued while we are a) a UKATA member & b) UKATA can still issue e learning certificates through their certificate generator. 24/7 Instant Logins - After completing the payment process your logins will be instantly sent to the email address you used at the payment process, if the email address that is entered is incorrect, Asbestos Training Limited cannot guarantee instant login details being provided. In addition if you do not click the link back to our website, your logins will be also delayed and Asbestos Training Limited, again, cannot guarantee instant access to the asbestos awareness course site. PHASE ONE - UKATA Asbestos Awareness within six months prior to the remainder of the training course being completed. PHASE THREE - Practical training on the given tasks as required by CAR 2012, ACoP L143, this will involve drilling holes, removal, PPE, decontamination etc. 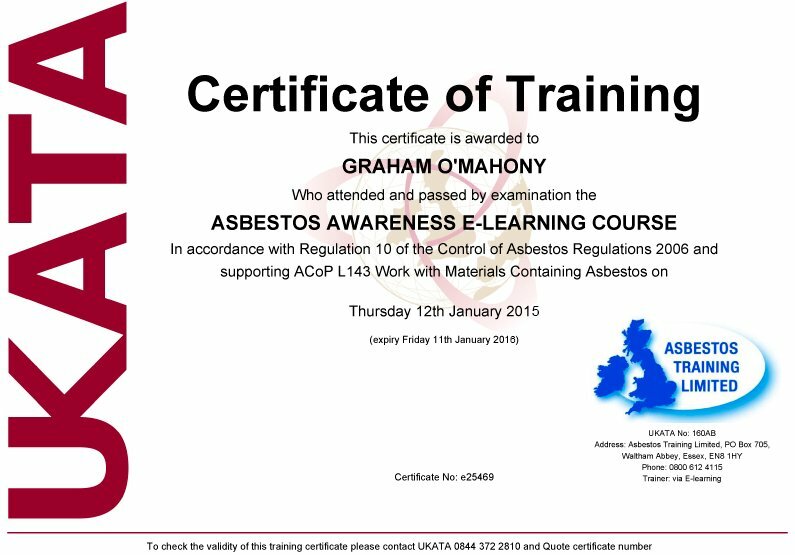 Any person booking on the Non-Licensable Works training course for one day must ensure that they have completed or will complete a UKATA Category A Asbestos Awareness training course within 6 months prior to the start of the course. 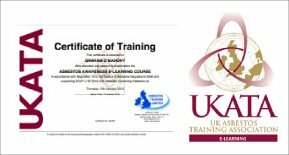 This can be delievered by way of face to face training or via UKATA approved E Learning training. Any person who fails to complete this prior to the training will not be allowed to complete the training and may, at the discretion of the tutor, be asked to leave the training course. Where this occurs, no refund for the booking will be given. Any delegate who has met the requirements of item 1 above must ensure that a copy of their training certificate is forwarded to info@asbestostraininglimited.com stating that they have completed the course and provide details of the one day non licensable course that they have booked on. Failure to do action this, we reserve the right to invoke item 2 above. request that the delegate agrees to identify the training provider and tutor against any accident that could have been prevented if the PPE was worn. Whilst every effort is made to ensure our E-Learning is suitable across all devices, we suggest you ensure your web browser is current. The best way to check the status of your web browser is by visiting http://www.whatbrowser.org. This website will give you details of the version and if there are any updates required. 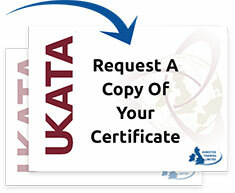 As per UKATA's E-Learning standards, we also recommend a screen size of 10" or more and a minimum of 7".